The 24ft Marine Tenders were the largest of the three types which included 22ft Tenders and the 23ft Tenders, the latter mostly convened to WT repair craft. 24ft Marine Tenders were built by many builders, however BPB built a large proportion and MT 2800 is one built by them. There were three variants of the 24ft type, however the Mk2 was the most numerous, and MT 2800 was the first Mk2 production craft. 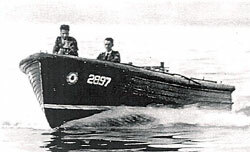 The RAF used the craft for general duties which included ferrying personnel to other larger craft afloat and to flying boats, as well as general harbour duties. MT 2800, built by BPB as their Yard No. 1961 was completed and taken on charge by the RAY at 62MU Dumbarton on 24.09.41 She was the same day allocated for service at Durban in South Africa ai~d was shipped there later the same year. According to RAE records she was later at St. Lucia (South Africa) in May 1943 and then at Congella in February 1945. She was retained by the SAAF after WWII and served with them at Langebaan attached to the No I Motor Boat Squadron. MT 2800 was transferred to No 3 Motor Boat Flight along with 3 SAAF 63ft HSL's and two dinghies on 05.1256. MT 2800 continued with the SAAF at Langebaan into the 1960's and thereafter after when the Navy took over the Motor Boat Squadron. MT 2800 was eventually Struck Off Charge by the South African Navy (SAN) in 1990 and was last at sea in 1992. In 1997 Willie Burger saved the boat from destruction when he intervened when the tender was up for disposal. Attempts to restore the craft were later hampered by lack of funds, despite plans to use her for evening cruises on Langebaan Lagoon. In SAN service she was painted grey with a green deck, yellow engine cover and displayed her number in yellow on the bow, - she was subsequently painted blue and given the name CAMERON L when saved from the breakers yard. MT 2800 is currently owned by the SAAFA West Coast Branch and has been stored undercover just outside the Air Force Base Langebaanweg, but has faced a bleak future In mid 2002 the South African Air Force Museum indicated they had no use for her and would not restore her. ST2800 has now been taken on as restortion project by a group of enthusiasts in Cape Town South Africa. We will keep this page updated as this restoration progresses.